Hook fasteners are the ideal accompaniment to your loop fabric displays, as they enable you to easily arrange and update your display. They are available in a variety of size packets, in either strips or dots depending on your preference. 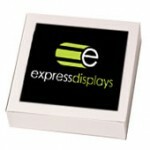 Not only are they simple to use we would always recommend them in order to extend the life of your display product. Unlike using drawing pins, nails or safety pins, hook fasteners do not damage the fabric by making holes in your display. Hook fasteners can be used within all of our display boards, fabric pop up display stands and fabric banners.